Join Us!!! We are looking for someone to help us cover Honduran basketball. Please send us an e-mail. Newly promoted CD Asociacion de Basquetbol Temuco (Liga Nacional) inked 26-year old American forward Abiodun Adegoke (203-113kg-91, college: Midwestern State). He played in the summer at Banco Atlantida in Honduran Liga Mayor. Adegoke managed to play in three leagues in three countries last year (!!!). In four Liga Centroamericana games he recorded 6.8ppg, 6.8rpg and 1.0apg. The most of last season he spent at Shkupi (Prva Liga) in league where in 14 games he averaged impressive 16.8ppg, 11.4rpg, 1.4apg and 1.4bpg. He was also selected League Player of the Week. Adegoke also played for Dinamo (Higher League) in league. In 10 games he had 13.7ppg, 6.4rpg and 1.7apg. He has played previously professionally in Italy (Stabia) and Bolivia (Calero). 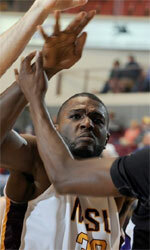 Adegoke attended Midwestern State until 2015 and it will be his fourth season in pro basketball. 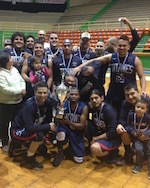 Atlantida have won Liga Mayor De Baloncesto 2018 in Honduras. In the decisive third game of the Finals they beat Icevic 70-66 to win the series 2-1. William Waterhouse (200-C-75) stepped up with 22 points and Denesson Lucas notched 20. Earlier Icevic posted a 79-66 win in game 2 to tie the series. In that game Alvin Cacho (189-G-87) top-scored for the winners with 24 points and Josue Amador netted 14. Alex Alfaro followed them with 12 points. Ernesto Leva replied with 13 points in a loss, whilst Denesson Lucas and Cristhian Williams (98) had 12 each.